Italy, unlike the United States, has a territorial tax system. This means companies are taxed only on income earned in Italy but there’s no effort to impose tax on income earned – and already subject to tax – in other nations. Under America’s worldwide tax regime, by contrast, U.S.-domiciled companies must pay all applicable foreign taxes when earning money outside the United States – and then also put that income on their tax returns to the IRS! The U.S. Corporate Income Tax…produces remarkably little revenue – only 1.8 percent of GDP in 2013, but entails major compliance and collection costs. The IRS regulations detailing corporate tax provisions are tome length and occupy small armies of accountants and lawyers. …many economists…have suggested that the tax may actually fall on workers, not capitalists. Regarding who pays the tax, shareholders bear the direct burden of the corporate tax, of course, but economists believe workers are the main victims because the levy reduces investment, which then means lower productivity and lower wages. Statists would like us to believe that capitalists and workers are enemies, but that’s utter nonsense. Both prosper by cooperating. There’s a very strong correlation between a nation’s capital stock (the amount of investment) and the compensation of its workers. So it’s no surprise to see that’s precisely what the authors found in their new research. This paper posits, calibrates, and simulates a multi-region, life-cycle dynamic general equilibrium model to study the impact of U.S. and global corporate tax reforms. …when wage taxation is used as the substitute revenue source, eliminating the U.S. corporate income tax, holding other countries’ corporate tax rates fixed, engenders a rapid and sustained 23 to 37 percent higher capital stock… Higher capital per worker means higher labor productivity and, thus, higher real wages. The impact is significant, both for worker compensation and overall economic output. …real wages of unskilled workers wind up 12 percent higher and those of skilled workers 13 percent higher. …on balance, output rises – by 8 percent in the short term, 10 percent in the intermediate term, and 8 percent in the long term… The economy’s endogenous expansion expands existing tax bases, with the increased revenue making up for roughly one third the loss in revenue from the corporate income tax’s elimination. By the way, the authors bizarrely then write that “we find no Laffer Curve,” but that’s presumably because they make the common mistake of assuming the Laffer Curve only exists if a tax cut fully pays for itself. But that’s only true for the downward-sloping side of the Laffer Curve. In other cases (such as found in this study), there is still substantial revenue feedback. Now that I’m done nit-picking about the Laffer Curve, let’s now look at one additional set of results from this new study. …each generation, including those initially alive, benefits from the reform, with those born after 2000 experiencing an 8 to 9 percent increase in welfare. I should point out, incidentally, that economists mean changes in living standards when they write about changes in “welfare.” It’s a way of measuring the “well being” of society, sort of like what the Founders meant when they wrote about “the general welfare” in the Constitution. But, once again, I’m digressing. Let’s focus on the main lesson from the paper, which is that the corporate income tax imposes very high economic costs. Heck, even the Paris-based Organization for Economic Cooperation and Development (which is infamous for wanting higher tax burdens on companies) admitted that the levy undermines prosperity. The study even finds that workers would be better off if the corporate income tax was replaced by higher wage taxes! To learn more about the topic, here’s a video I narrated many years ago about cutting the corporate income tax. There was less gray in my hair back then, but my analysis still holds today. * For the umpteenth time, I want to emphasize that the goal should not be to maximize revenue for politicians. 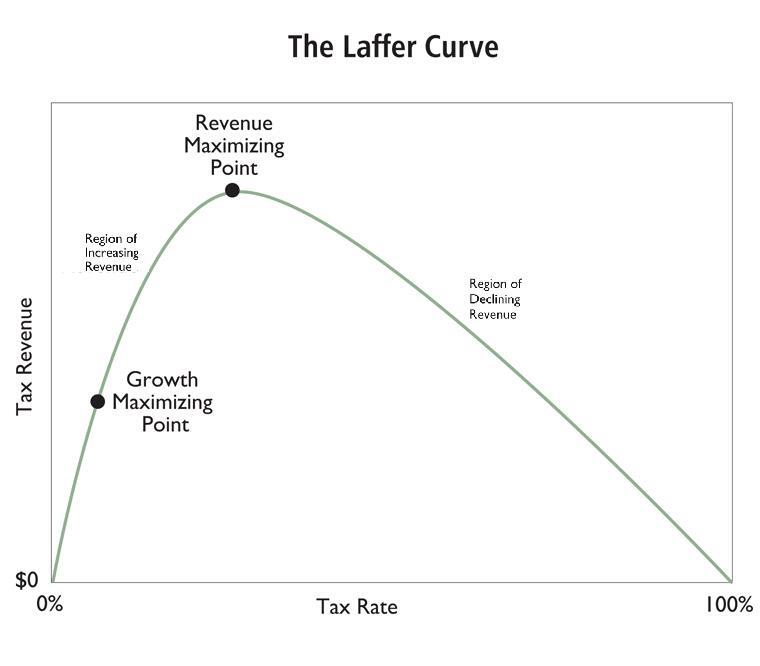 Instead, we should strive to be on the growth-maximizing point of the Laffer Curve. MATCHING the average world economic growth trendline. That level seems to be a trendline of 4-5% annual growth. Anything, ANYTHING short of that, portends deterministic decline as easily derived from the simple arithmetic of diverging geometric series. What do you think are the chances of that happening, as effort-reward curves keep being flattened by increasing cronyism, increasing direct redistribution and increasing indirect redistribution through macroeconomic and regulatory manipulation? So, there you got it in a nutshell. From the vantage point of 2014, your future as an American citizen stares you right in the eyes. In closing the vicious cycle, Americans will soon start voting like the Europeans, the French, the Greeks. Once the left’s agenda is implemented, and America sheds its “endemic detrimental selfishness” what will be the unique characteristic left in America that will justify and sustain America’s exceptional prosperity standing in the world? The left tends to shun religion. However, in economic matters they seem to mysteriously share the delusional religious belief that something from “beyond” something supernatural, something little understood but omnipresent, must be sustaining America’s exceptional prosperity. They are both wrong. They will both suffer, but — like their European brethren they are trying to emulate – will never learn. To a majority of voter-lemmings the coercive uniformity the environmentalist matrix – with all its collateral damage of cronyism inefficiency and waste etc. – is still worth it for the small chance of affecting the overall trajectory of the planet. Slowing down aggregate planetary growth by 1% and thus, amongst other things, push the date of cancer cure discovery from, say 2040 to 2060? Still worth it. Just think about it the first time you start seeing shadows in your CAT scan. And think that if statism and other forms of coercive collectivism were not such a dominant self-imposed suppressor of human growth in the last few centuries, we would already be living in a world free of cancer. To expect that people (whether greedy investors, shareholders, or your 401K) will engage in delayed gratification for a mere 1% real annual return on their wait is asinine – the typical asinine fantasy of leftists who hope that one day those greedily smarter, those greedily more productive or those greedily harder working will be either convinced or cordoned in a regulatory box where they will have little choice but to produce for the common good of distant unknowns rather than the benefit of their own families. Will happen for sure! I’m telling you, prosperity is just around the corner. But that corrosive hope lives eternal – and the decline continues, as three billion people are finally catching up to the delusional voter-lemmings of the western world. While American companies being bought by foreign ones is not a bad thing per-se, in this context, it is yet another symptom of America’s decline trendline. A decline trendline that is poised to follow the further along European decline. It will be difficult for voter-lemmings to extract the declining baseline growth trendline of the US economy amongst the inherent fractal noise of the economy. The voter-lemming bamboozling narrative is that the economy seems to be picking up speed, and voter-lemmings believe that a return to 3-4% growth trendline is somewhere in the cards. Amongst the noise of short term economic variations they cannot discern the more important long term depressed growth trendline of flattening effort-reward curves. But remember, when most people believe in something wrong and delusional, those who have a bit more brains can profit from the majority’s delusion. Oh but we have to tax those greedy corporations. They are already paying far less than their fair share.